It’s been a while since I updated, work and personal life have intruded and made it more difficult for me to record and post. That’s all coming to an end though! Although I have a major life change coming up (impending fatherhood), the podcast will continue. And the site is looking a lot better than it did already. a much nicer theme – this is the 2013 theme from WordPress! better sharing buttons – so if you like something and want to tell other people please do! better commenting – spam is now being blocked by Akismet! a Twitter feed – because, well, you might not be following @VivaSurvivors yet! Another piece of infrastructure that is being put together is the Viva Survivors Podcast Newsletter – I don’t have all of the answers about this yet, but soon I’ll have a subscribe option for this, along with details of what to expect and when to expect it. This isn’t the first stage in sending you lots of advertising, just a means to send on links and thoughts about the viva that don’t fit with the main podcast (at the moment). I’ll write again when the newsletter is started, but keep an eye out for that. The last thing I want to mention for now is that I have been collecting links to articles, blogposts and media related to the PhD viva. One of my goals for the next week is to sensibly curate that for a new Links and Resources page on the site. If you know of any really valuable thoughts/links to share, then please let me know so that I can pass that on via the site. 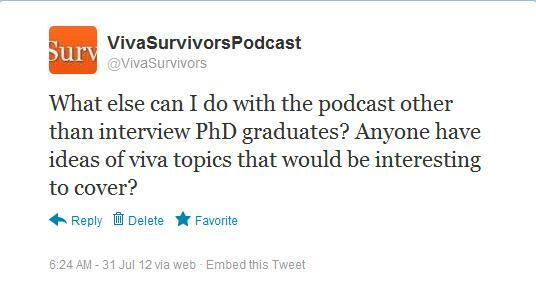 That’s all for now: keep an eye on @VivaSurvivors on Twitter, and please comment or email me if want to get in touch! As I’ve been tweeting, the next episode should be recorded later today; with any luck I will be editing that tomorrow, and then it should go up on Wednesday or Thursday. I’m interviewing another maths colleague, but perhaps someone who had a different experience to the two mathematicians that I have talked with so far. I’ll tweet loudly when the podcast is released! I’m also still mulling over what else might be interesting to have on the site: I’m looking for ideas of what might be really valuable for people who are preparing for their viva, or perhaps just things that might be a bit inspiring. If anyone has any ideas then do comment or email and let me know. I’m also looking to widen awareness of Viva Survivors by writing articles on preparing for the viva for University PGR-related blogs. If you would like a top 5 tips or similar then get in touch. This is definitely something that is in my mind, and I’m going to look around my contacts and see who has experience that they can share. I’ve also been thinking about sharing some funny viva-related pieces. Many of you might be familiar with PhD Comics, which I am sure has had some viva-related humour in the past. As well as that I was forwarded a really funny piece of thesis examination preparation, care of McSweeney’s, “FAQ: The Snake Fight Portion Of Your Thesis Defence“. You can go and read the rest of it here – I am extremely thankful that I defended my thesis in the UK, where you simply have to know a couple of sets of Morris Dancing, rather than have to fight a snake! To come back to my main question though: what else might be good to include in the podcast or on this site? What helpful resources or conversations could I try to provide? Let me know in the comments or email me!